A little while ago, I started a new job at the direct sales based jewelry company, Origami Owl, doing their product/catalog styling and photography. On November 1st, we released a brand new line called Tagged, which is completely customizable, to best represent you! The collection is near and dear to my heart because I love what it stands for - empowerment. Japanese scientist, Masaru Emoto, claims that water can change its shape based solely upon words. When negative words were spoken to the water, such as, "I hate you, I want to kill you", the water transformed into polluted, distorted shapes and retained no beauty. But, when positive words were spoken to the water, such as "love" and "thank you", the water grew into beautiful crystals. As humans, our bodies are made up of 72% water. If Dr. Emoto's claims are correct, then how do words really effect our make up, our health, our minds, and our spirits? Words do have the power to make us, break us, uplift us, and/or change us. But no matter which way you spin it, they shape us. Which is why positive affirmations are so important. 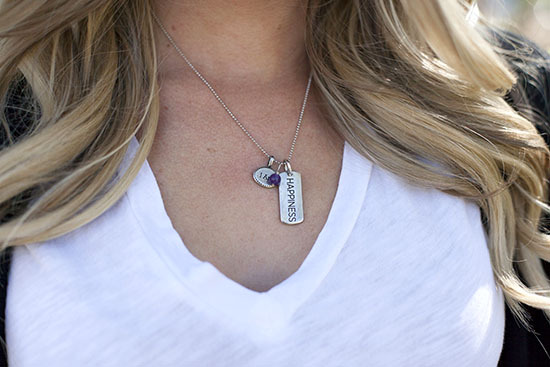 With our new Tagged Collection, you can wear your affirmation close to your heart. With empowerment tags such as, "I Am", "I Can", "I Have" and "I Will", along with inspiration tags, such as "Enough", "Happiness", "Fearless", "Blessed", etc., the collection allows you to affirm what you are, and more importantly, what you choose to be. There are also natural stones, or earth elements, that contain energies that channel certain characteristics specific to each stone. I am wearing "I am Happiness" accented with amethyst, which is a stone of pure, emotional love, and is meant to be cleansing. It's quite interesting, how wearing this necklace has helped me believe in myself more. Check out our video, and my awesome-ish dance moves below! And if you want more info about Origami Owl, or how to become a designer, check out our website here! This is not a sponsored post, or affiliated with Origami Owl. The opinions expressed are solely my own. So yesterday I was given one of the cute catalogs of these products. And I almost blurted out loud "I know that girl!" Then I realized everyone would think I was crazy when they found out that I didn't actually know you--that I just read all about you! haha. Loved your picture on the cover. I definitely took a catalog home to look at! They have the cutest things! This is beautiful & powerful all at the same time. Thanks for the inspiration. So encouraging to hear of more and more companies out there like this who want to EMPOWER! What a fun opportunity for you! This seems like the perfect fit - and I love how your necklace ties in to your blog as well. And cute cute is that video? Love it! The lockets are adorable! They would make a cute Christmas gift. My little niece would love them! I love everything about this post! I actually took an entire course in college decorated to these studies about water and the effects of emotions on the snowflakes and water crystals. The video was so awesome and you look Gorg as always! How cute is this!? Love the message and the video is adorbs! This is so great! I love this idea. How do we buy one? I love this post! The concept with water is something I am starting to believe in my everyday actions. When I bring too much negativity into myself through words or actions it gets me nowhere. Such great insight! I totally believe that we become what we believe we are...the good and the bad! So fun to see you pursuing this career change with full force! Oragami Owl is lucky to have you! What amazing products and philosophy behind them. I am totally interested in an I am Fearless necklace. Love the video too! You and your co-workers are the cutest ever!! I love this line of jewelry! SO GREAT!! You ladies are adorable with your dance moves and cute shoes! Sounds like a lovely line...perfect for myself and as gifts. Haha, you guys are so cute! So THAT'S what you were doing all that time ago in your instagram photos. This post comes at just the right time as I'm looking for cute and personal christmas gifts for my girlfriends. Thanks! I've never heard of this brand before, thank you for sharing. What adorable jewelry! Love the idea of this and will definitely be looking into this brand - that necklace is adorable! Great campaign and great message! Congrats on the new job. Sounds like a great, uplifting place to work. Love this post! So interesting to hear how much words affect our spirit and emotional stability. It definitely makes sense though. I just ordered "I am Blessed" with the jade earth element for my sister. She struggled with infertility for 2 years and is now due with their first baby in February. Will be a perfect gift for her. Thanks for sharing and what a neat company to be a part of. That's amazing. I believe that words can change water. My mother would tell me that as a girl she and her friends would go near the river in her home country and say "mean" things to. These mean words would make the waves become strong and ferocious. Once they stopped the waves would calm down also. Very powerful stuff. My neighbor is having a origami owl party and I saw the catalog and I was like, "that girl looks just like Katie from running on happiness!!" And sure enough, it is you!! This probably sounds crazy but I felt like I kinda knew you on a personal level from your blog. Ok craziness aside, I love the pieces from the collection!! Well written words. I love what you said about positive affirmations. I definitely need to do that. And of course I will check out the collection, they sound like something I would really want to buy.